Many parents tend to get a little nervous about introducing babies to new foods, especially when it comes to peanuts. That's mainly due to the fact that peanuts are among the most common of food allergens. In fact, Food Allergy Canada estimates that as many as two children in every hundred have a peanut allergy. Allergic reactions to peanut vary. In some cases, a child may experience a rash or a few hives around the mouth. In other cases, the reaction can be much more serious, and include swelling of the lips, eyes, or face; vomiting; widespread hives on the body; or breathing difficulties. No one knows for sure why children become allergic to peanuts. But research published in 2015 by Professor Gideon Lack at Kings College, London, suggests that the risk of developing a peanut allergy can be reduced by introducing children to peanut early in life. The children, between the ages of four and 11 months, were followed until they were five years old. Half were given a snack food containing peanut at least three times a week, while the other half were given a peanut-free diet. About three per cent of children given peanut developed a peanut allergy, while about 17 per cent of kids who did not receive peanut ended up developing one. Lack says the results challenge the conventional wisdom surrounding peanut allergies. 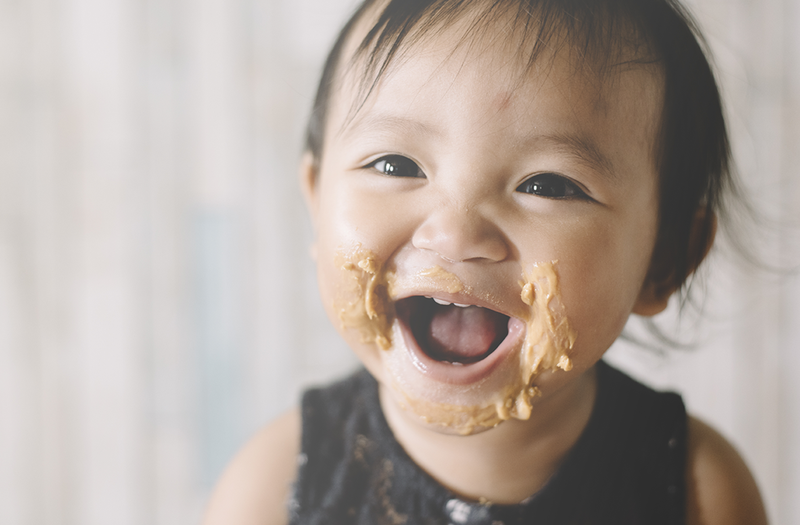 "For decades, allergists have been recommending that young infants avoid consuming allergenic foods such as peanut to prevent food allergies," Lack says on the LEAP study website. "Our findings suggest that this advice was incorrect and may have contributed to the rise in the peanut and other food allergies." Following the study, the Canadian Society of Allergy and Clinical Immunology (CSACI) updated its guidelines covering kids and peanuts. The new guidelines state that children at high risk of peanut allergy - those with severe eczema, an egg allergy, or both - should be evaluated by a health-care provider before being introduced to peanut. But all other children, even those with mild or moderate eczema, can be introduced to peanut when they are able to eat solid food. A child is usually ready to eat solid food at around six months of age, when they are able to sit up with very little help, hold their head up with good neck control, and won't push a spoon out of their mouth with their tongue. Before introducing your child to peanut, try other iron-rich, solid foods. Your child needs iron at six months, so it is important to test readiness for solids with iron-rich foods such as meat, fish, eggs, tofu, beans, lentils and fortified infant cereal. An easy and safe way to provide peanut is to mix two teaspoons (10 ml) of smooth peanut butter (or powdered peanut buttter) with three teaspoons of warm water, breast milk or formula. Allow to cool. Offer a small amount of this peanut butter mix to your child. Wait 10 minutes. If you do not see any signs of an allergy, continue feeding the rest of the peanut butter mix. 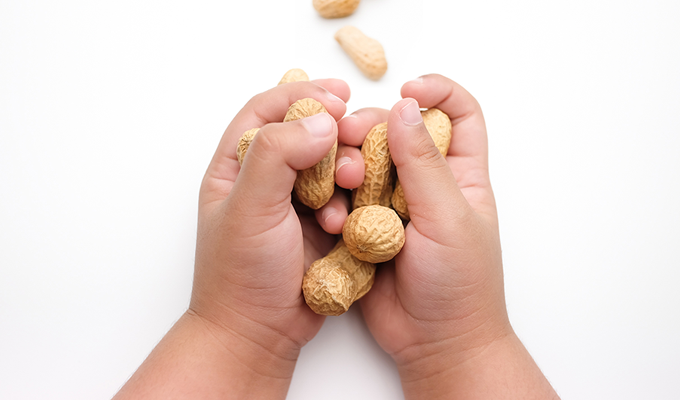 Whole peanuts and thicker peanut butter pose a choking risk, so do not give them to children under four years of age. Feed peanut butter during the day and not before your child's bedtime. This will make it easier for you to see a reaction. Usually, symptoms of an allergy to peanut will appear between a few minutes or a couple of hours after ingesting. If you see breathing difficulties or any severe allergy symptoms, call 911, as your child needs immediate medical attention. Once you have introduced peanut butter, continue to offer it on a regular basis so that your child keeps tolerating it. It is recommended that you offer two teaspoons (10ml) at least three times a week. Add two teaspoons of smooth or reconstituted powdered peanut butter to infant cereal, mashed fruits or yogurt. Use peanut butter or peanut flours in batters, baked goods and sauces. Add them to muffins, loaves, curries and stir-fries. Spread peanut butter thinly on toast and cut toast into strips. For more information on this subject, contact your child's doctor or a health-care provider. Rosemary Szabadka is a registered dietitian with the Winnipeg Regional Health Authority.